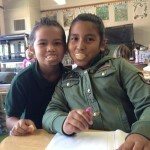 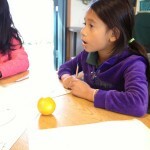 Arts Integration, Week 1: How can we use more of our SENSES to tell the Whole Story? 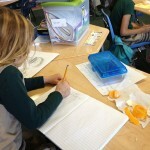 Willow Creek’s 3rd graders are exploring ways to use all of their senses to tell a more complete story (in their descriptive non-fiction, myths, and poetry). 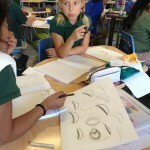 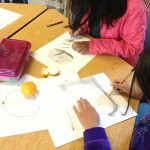 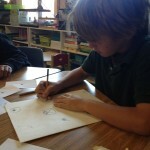 Mentor Artist Suzanne Joyal has been working closely with third grade teachers Anne Siskin and Maya Creedman to create an in-depth project combining fine art techniques with writing lessons to enhance stories. 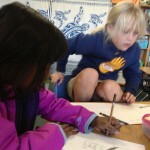 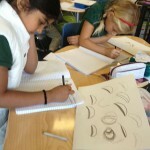 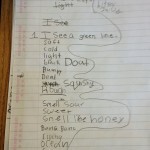 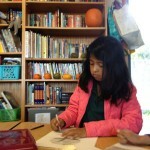 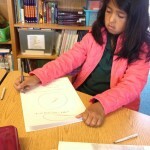 In class, students have been writing in-depth poems about a color. 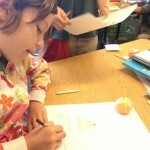 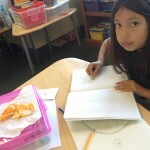 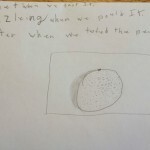 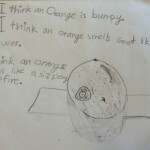 In our first art meeting, we began by writing 3 things we know about an orange, and then drawing one from memory.